KITRCP2005CHARCP2650BLA - Value Kit - Rubbermaid-Black Universal Drum Dolly (RCP2650BLA) and Rubbermaid-Chrome Heavy Duty Dust Pan (RCP2005CHA) by Rubbermaid at Blog Free Here. MPN: RCP2005CHARCP2650BLA. Hurry! Limited time offer. Offer valid only while supplies last. lt;stronggt;RCP2650BLAlt;/stronggt;lt;BR/gt;Rubbermaid-Black Universal Drum Dollylt;BR/gt;Add mobility to Brute drum containers sold separately. lt;stronggt;RCP2650BLAlt;/stronggt;lt;BR/gt;Rubbermaid-Black Universal Drum Dollylt;BR/gt;Add mobility to Brute drum containers sold separately. Heavy-duty swivel casters simplify maneuverability. Professional-grade plastic construction. Colors: Black Dolly Size: 24 3/8amp;quot; x 7 1/8amp;quot; Capacity Weight: 500 lbs.lt;BR/gt;lt;BR/gt;lt;stronggt;RCP2005CHAlt;/stronggt;lt;BR/gt;Rubbermaid-Black Universal Drum Dollylt;BR/gt;Handy dustpan features a tapered front edge to help simplify sweeping-up. Heavy-duty, moderately flexible plastic provides commercial-grade durability. 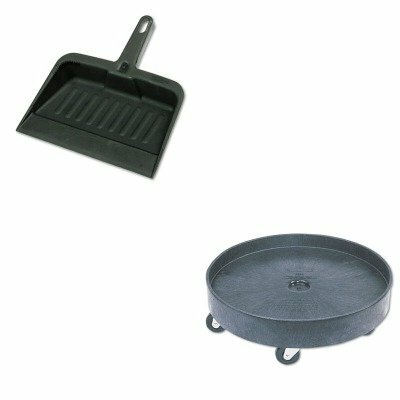 Lanyard handle-hole allows you to hang and store the pan out of the way. Material(s): Polypropylene; Width: 8 1/4quot;. ~ Includes one dustpan.